Before reporting about my first race of this season, I need to wrap up last season. I started this post in December and it has been waiting to be published ever since. Well, all I really did then was upload the pictures. I figure that whatever memories of each race have stuck with me this long, might be the only ones worth mentioning anyway. Really what I should have done is analyze each race in detail, look at the training, nutrition, times, etc. But how much fun would that be? I will save that for when I am a Pro. Haha. If you want to know what happened before June, go here. The problem with this race (and my excuse for not winning) is that the women started in two different heats. 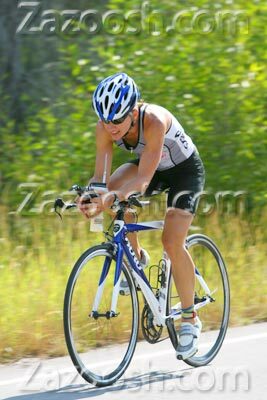 Since my teammate, good friend, and great competitor Caprice, happens to be 10 years older than me, she started 5 minutes behind me. So there is really no way of keeping track of each other and knowing how the other one is doing. Biking and running in 'first' place with no one else really close, I tried to push myself as hard as I could but in the end Caprice beat me by 20 seconds. 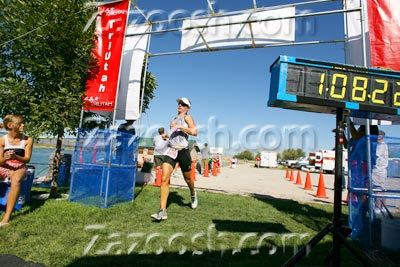 And yet, she crossed the finish line after I did. Really annoying for both of us. What a great race it could have been! but I am happy with the result. This was a super fun race weekend with lots going on. The venue, a private waterski lake in Honeyville, was perfect. Complete with a place for camping and a water slide. Friday night, Karl competed in the 'Jack Triathlon'. Men only. Karl raced well considering that he has been concentrating on running, biking some, and totally neglecting swimming. 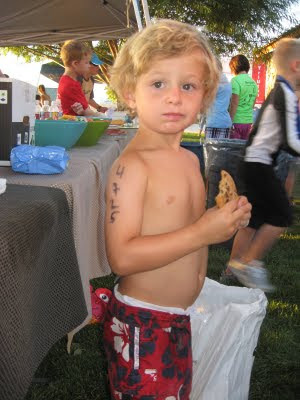 Then it was Noah's turn and you can read all about his first triathlon here. On Saturday morning it was my turn. Before any race, I love to chat with friends, see familiar faces, make new friends, and check out the competition. I think this is my favorite part of racing. This was a rather small event and so I thought I knew who I was up against. Little had I noticed a girl from Wyoming who killed me in the swim. I tried to stick with her but to no avail. I thought: "Must be a swimmer. I'll catch her on the bike." NOT. I hardly made up time on the bike at all and got a little nervous. But luckily the race was not over yet... I stormed out of T2 ready to give it everything I had in order to run her down. Which I did. It was actually easier than expected and after that I never looked back. That's how I like it. I was very happy. I hardly ever win races from behind. I either get off the bike in 1st place and hold it or I don't win. A lot of that is mental and I am glad to know that I can push it hard. 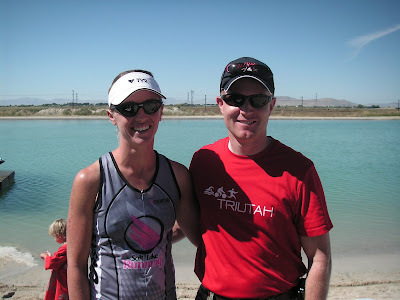 Many thanks to my friend Chris Bowerbank from TriUtah for putting on such a wonderful race weekend. My little family loved it. I really enjoyed this little race close to home. Race morning, I hopped on my bike and rolled over to campus. My friend, Scott, was there with his wife Jen (who happens to be my best friend) and kids. Scott was doing his first triathlon and I couldn't have been more proud of him. He has come a long way. His story is very inspirational and you can read about it here. We all started off on our bikes which makes for a crazy start! Luckily, they had us women start a few minutes after the guys. I love reeling in the boys one by one. Makes for an exciting race. Congratulations, Scott! You were amazing! 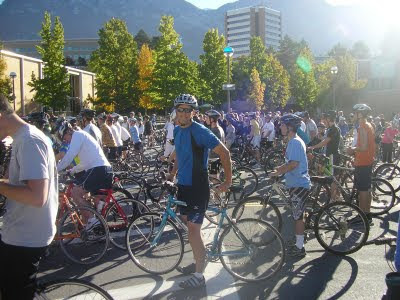 We biked the BYU loop twice, ran through campus, and finished by swimming in the RB pool. It was definitely a home race for this girl! It had been a long season but I could not pass up the opportunity of another fun home race! 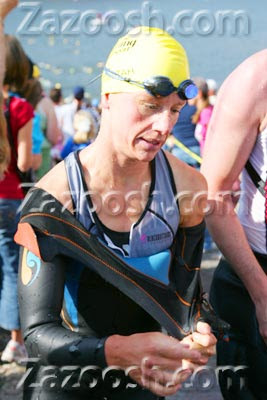 Even though I am not a big fan of the run-bike-swim format. But I am also not a fan of being wet on my bike in the winter. 2 memories from this race stand out. One good, the other bad. 1. After the gun went off my friend, Leslie, and I were just chatting along for the first 1/2 mile of the run. Then we remembered that this was a race and we did not know who was behind us trying to take advantage of our 'leisurely' pace. So we shut up and went to work. 2. I noticed a guy, that I had just lapped, stuck to my rear wheel. After a while I got really annoyed, turned around and yelled something like: "You are not supposed to draft!!!!!!!!!" He looked at me and said: "Really? I had no idea." He was actually serious. Are you kidding me????? 2009 was definitely very successful. 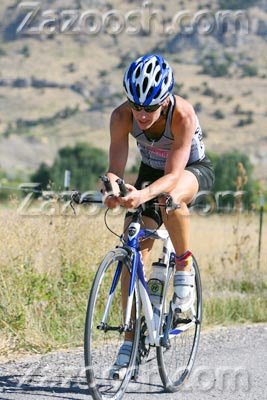 I was able to win 9 out of the 10 sprint triathlons I competed in which makes me very happy. Thank you for all your support and encouragement. I am super excited for this season! It is here already which is a little scary. I am definitely not where I would like to be but things are coming along. Except for my body. It has been falling apart lately. I must be getting old. So are you doing sprint or full triathlons this year? 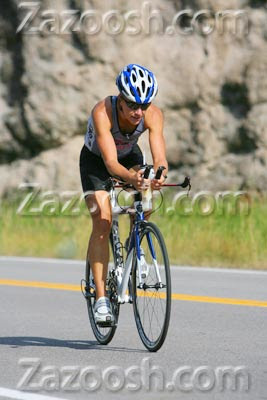 Are there lots of tri's around Flagstaff i sure hope there are. Good job on having such a great season and I'm sure you will do great this year. This is not braggy at all. You're just documenting your life! AND you are an amazing athlete. My dream is to someday have arms like yours. You're one hot mama! Also, I too heartily enjoy passing guys in races. I can't imagine how awesome it would be to pass nearly every single one of them! Look out Arizona, there's a hurricane comin'! You are amazing. I bet all those boys new goals are to pass u :-) Too bad they never will. Good luck in Arizona and I hope u keep up ur blog so we know all ur happenings. Even if I don't always comment, I always read and enjoy living vicariously through u and ur awesomeness! You finally published this post. As always, it is enjoyable to read. I love the pics. You are so great! I plan on coming to more than just one of your races this season to cheer you on and take some pics of you and your family. I'm so glad we are buddies! 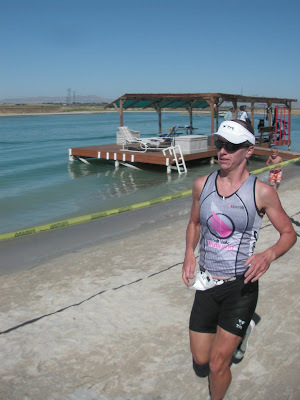 I love reading your race reports! Great season last year and thanks for being such a inspiration. Not to mention getting me to learn to swim. You're awesome!